Commercial mortgage is about matching your property type and location to the right lender - and we know who these lenders are. While there are many lenders that will show interest in financing your property – there are only few that can actually put your commercial financing in place. This is different than mixed residential commercial mortgage. 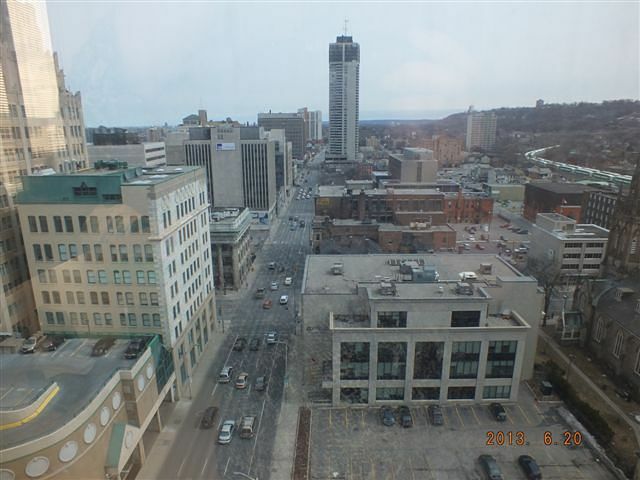 Photo: Hamilton, Ontario downtown commercial core and the Go Train Station to the right. Commercial lending can be a moving target. Why? You have to know who’s lending, and who’s not, at any given time for any type of commercial property. Commercial lenders are specific about the type of properties, locations, and industries they will consider. Even if you fit the lender’s criteria today, there is no guarantee that they will help you because their portfolio and funding criteria are always changing. For example, if a lender has too high a concentration of assets in one category, industry, or even geography, they may decline a perfectly good application that they would have approved and funded only months earlier. Several of my clients experienced that - even though they made all payments on time. What is worse, their lender gave them only 30 days to find a new mortgage. Also, proof of income and property value is calculated differently than that in residential mortgages. So, what about the commercial mortgage proof of income? Value for financing purposes value is calculated based on the income the property generates, even if the property can sell for more on the open market. When the property is used by the business owner then the question is who owns the property - is it an individual or a corporation that will be providing proof of income? Are you going from bank to bank hoping for a low cost commercial financing ? The lower the cost the longer it will take and the more difficult conditions you’ll have to meet. If you’re seeking lower cost financing, then be prepared to meet more terms and conditions to get this funding - hopefully you’ll have the necessary time lines to cover everything off and be sure that these conditions are achievable for you. But, time lines don’t mean much if you’re not working with a right lender in the first place. For example, say you have 3 months to get your financing in place, but after 2 months of providing the lender with volumes of documents, you still don’t have a firm commitment and when you get one, there are still more requirements to meet and now, you need more time. So, if you’re not working with the most appropriate lender right from the start, you risk running out of time and killing a deal or experiencing some form of cash flow or business interruption issues. We understand the process and will help you plan ahead to ensure successful closing. Lenders regularly change their financing criteria. You understood that the banker said “yes” – well, maybe “not quite”. Banks can change their lending policies without notice, based on their overall portfolio performance, state of the economy and/or industry, person in charge of the decision, and so on. Things like loan to property value ratio as well as commercial mortgage proof of income can change drastically and this can result in the commitment to be useless. We will protect you from such a problem by taking your application to the right lender – one who can actually lend on your property. Front line bankers you talk to are merely marketing people. Most importantly, when you go to the bank yourself, you do not have direct access to the loan underwriter making decisions on your application. The so called “manager of commercial mortgages” whom you’re required to meet with and discuss your situation, is merely a front line marketing person. This person’s job is to get as many applications as possible and pass them to underwriting where the real decision making process begins. If there is even a remote chance that their lender maybe interested in your application, this marketing rep will “sell”, “push” for you to fill out an application, without any regard as to how relevant his or her company is to actually be able to meet your needs. In most cases, these marketing reps may not even be able to tell how well your situation fits their lending model and/or have any idea what their underwriting and credit department will or will not approve at the present time. We deal directly with the appraisers and mortgages underwriters who are making the lending decisions on your application – this keeps us informed every step of the way and your timeline on track. Private lenders are an option for commercial funding under some circumstances. Here you have it! You can see that your valuable time is best spent on the business of making money. If you need commercial financing or are just planning ahead, the best first step is to give me a call so that I can quickly assess your situation and provide you with what I believe to be your most relevant options. Thank you for visiting this site and please come back often. Please share the commercial mortgage information with others using the buttons below.